Amid a deepening financial meltdown, making new investments presents higher-than-usual risks. But that did not prevent 7 Days Inn Group, one of China's largest budget hotel chains, from getting $65 million from private equity investors Actis and Warburg Pincus LLC. As the global financial crisis has made most private equity and venture capitalists extremely cautious, the 7 Days announcement seems almost eccentric. "In fact, our vote on whether to invest in the company came the day after when Lehman Brothers filed for bankruptcy. So you could imagine how bad everyone felt," says Lim Meng-Ann of Actis-China. "But our committee still agreed on the deal because we are positive about the perspective of China's economy." 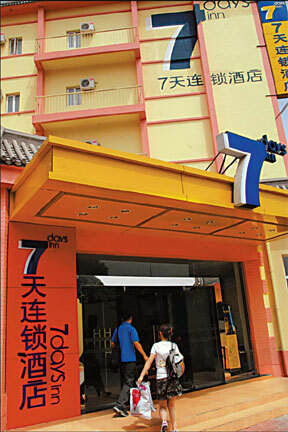 As a latecomer in China's budget hotel market, 7 Days Inn was established in 2005, targeting the students, travelers and people from small businesses. During the past three years, the company has successfully established a national network of about 270 hotels and attracted more than 3 million members in the country with its budget price policy and standardized services. Last September, Merrill Lynch, Deutsche Bank and Warburg Pincus injected a second round funding of $95 million in the Shenzhen-based company. Warburg made its first $10 million investment in 2006. Venture capital activities have been quite robust in China before the third quarter of this year when the global financial crisis started significantly diminishing the opportunities for fund-raising. A total of 20 new domestic and foreign VC funds raised $492.1 million in the third quarter, compared with $3.02 billion raised by 40 new funds in the second quarter, according to Zero2IPO, a research firm tracking VC activities. The endorsement venture capitalists gave to 7 Days underscores the budget hotel sector may be relatively unscathed by the difficult times, says Alex Zheng, CEO of 7 Days Inn Group. "Although nearly everyone will suffer, I believe budget hotels are less impacted by the financial crisis as people will become more cost sensitive," says Zheng. In anticipation that more people will switch to less expensive hotels, 7 Days will continue to expand, the CEO adds. Budget hotels took off in China since 2000 with the falls of thousands of small State-owned hotels, one of the last vestiges of China's planned economy. Boosted by foreign investments, budget chains in the country have increased from 30 hotels in 2000 to 1,700 by the end of 2007, with Home Inns, Motel168 and Jinjiang Inns taking up about 40 percent of the market share. Since last year, partly boosted by the Olympic Games, Chinese budget hotels started to expand rapidly as the number of new budget hotels opened by the top 10 budge lodging companies surged 125 percent, according to a survey by the China Hotel Association. But the Spring Festival snowstorm and the May 12 Sichuan earthquake as well as the tightened tourist and business visa policy during the Olympics reduced people's demands for traveling. "Although the budget hotels have experienced high speed growth in recent years, it only accounts for less than 1 percent in China's hotel industry, compared with 33 percent in the United States," says Lim from Actis. "I think the demand for budget hotels will increase as long as China's economy continues to grow." Lim says 7 Days' advantage is in its sophisticated IT system, which allows about 55 percent of 7 Days bookings to come from the company's online reservation system or WAP (wireless application protocol) site, or the mobile Internet. It's the highest rate in the industry and could help the company keep costs lower than its competitors. Despite his optimism, Zheng says the economic turbulence will have some impact on Chinese budget hotels. He says some of budget hotels' customers may look for even cheaper alternatives in difficult times. 7 Days Inn Group recently formed a trans-regional alliance of domestic branded budget hotels in China, in hopes to provide a unified marketing platform for the medium-sized and small budget hotel chain brands in China. That follows another Chinese budget hotel Hanting's recent move to launch a low-end brand hotel targeting the students. Zheng says under the current market environment, building up long-term advantages is paramount. He says 7 Days plans to open 70 to 80 new hotels by the end of next year and the company may look for an overseas IPO as the market recovers.